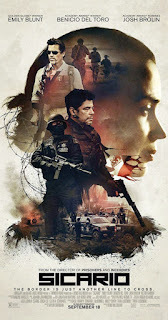 From its hard hitting first scene to an undeniable thought provoking ending, Sicario builds its brooding tension and suspense with almost graceful patience to keep us on the edge of our seats thought the entirety of the film. I anticipated viewing this movie and how it would tackle the much debated issue of border conflicts and the ongoing U.S. war on drugs. The film handles these social issues with almost uncanny attention to detail by portraying the conflict from both sides to give the audience a broader and clearer view of the conflict. The movie stars Emily Blunt (Edge of Tomorrow) as a FBI agent who volunteers to join a team of elite US agents and operatives tasked with hunting down a cartel and disrupting drug trafficking operations around Juarez, Mexico. Attached to the team as an advisor is Alejandro Gallik portrayed by Academy Award Winning actor Benicio Del Toro (Traffic, The Usual Suspects). Del Toro’s performance stands out among the rest because it is not only extremely vivid and gripping, but eerily mesmerizing. His character’s back story is never fully revealed but a personal tragedy by the hands of the cartel drives him endlessly to methodically exact revenge on those responsible. His screen presence is utterly absorbing and completely unpredictable which only made me more enthralled and shaken at times. His ability to portray a character that’s brutal and ruthless yet fascinating is equal to that of Javier Bardem’s performance in No Country for Old Men. Jóhann Jóhannsson’s music score helps and builds upon the films dark nature and adds biting suspense to scenes that captivate like no other I’ve seen in a while. Dennis Villeneuve (Prisoners, Incendies) directs the film in his usual fare of heavy character drama and gripping set pieces added on with stark and complex imagery thanks in part to cinematographer Roger Deakins who doesn’t pass up on the beautiful, yet ominous landscapes of the desert surrounding the film’s location.